Jesse Tyler, a black man in the South who chauffeurs for Miss Melny, an elderly white woman. Stop Miss Melny from getting killed by a train. Inspire her to speak up about racial inequality in the community. The ending is nice where Miss Melny steps up and invites Sam to sit next to her in the diner. 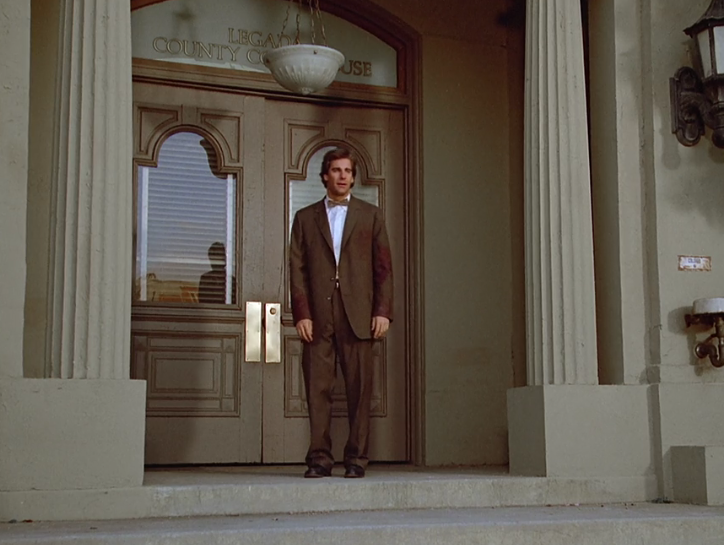 I thought it was strange for Al to be continually screaming at Miss Melny to stop the car before the train hits her when he knows that she can't hear him. But then she did "hear" him and thought it was her husband's ghost. I would have liked it better if she would have stopped the car for some other reason. This episode has a definite Driving Ms. Daisy vibe to it. 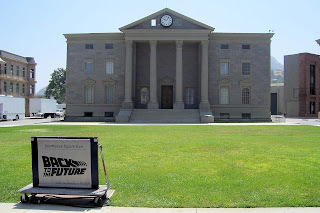 The movie came out after the episode (both were in 1989), but the play the movie was based on was from 1987. When I didn't see any recognizable MacGyver guest stars in the first ten minutes, I thought the streak would be over, but no sooner did I have that thought when on to the screen came Michael D. Roberts from The Challenge and Walking Dead. I've decided to make a separate page where I will keep track of all the MacGyver guest stars. Speaking of MacGyver, the car that the two troublemakers use to run Sam's granddaughter off the road looks a lot like MacGyver's Chevy pickup from seasons 5 and 6. 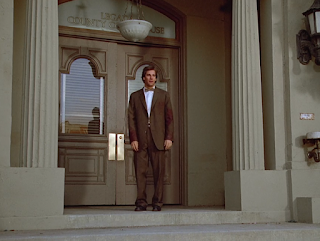 In my Double Identity review I mentioned that the street in Buffalo looked a little bit like the street in Back to the Future. 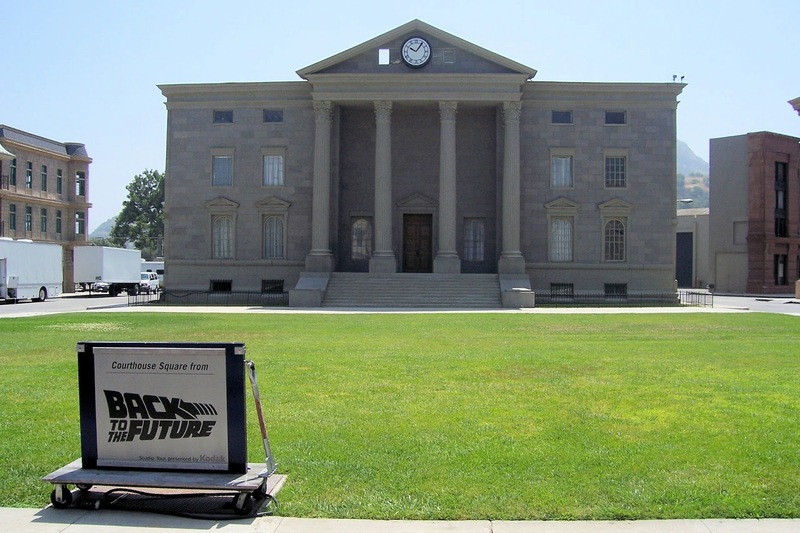 Well, in this episode the courthouse that Sam emerges from is absolutely the same courthouse from Back to the Future (compare the columns in the pictures below), and he talks to Miss Melny in the famous town square from the movie. This is my least favorite episode so far. It wasn't bad, but my rankings are all about how much I like a particular episode, not if it's well done. And while an episode doesn't have to contain all lollipops and rainbows for me to appreciate and enjoy it, there's not much here that I found enjoyable, and this isn't one that I would be all that excited to rewatch. Starting to wonder how far apart we're gonna be on this show. Your least favorite thus far is my #1 thus far. It was far from perfect but the story held my interest the most and I appreciated that the subject matter was more consequential than challenging a cowgirl to a contest of who can pound in fence posts the most quickly. Aside from the best-yet pacing and exposition, I appreciated how Sam's humanity prodded him to take up the cause of civil rights after living in the shoes of a black man in the segregated 1950s South. While I loved that theme in principle, I felt they got a little carried away with it as "Jesse" insubordination never relented and he failed at his objective of saving the old lady's life, and acted oddly ambivalent about it while moping in the jail cell as Al described saving her in Sam's absence. It's also kind of jarring to hear the N-word said so casually just as it was on "MacGyver" only two months earlier with another episode guest-starring Michael D. Roberts. It's certainly a reminder of how much the world has changed in the last quarter century, even more so than Al's public cigar smoking. I certainly got a "Driving Miss Daisy" vibe from it too so it's interesting that this episode preceded that film. I also thought the thugs' old truck looked like MacGyver's old Chevy truck he got from Grandpa Harry that he drove around mostly in season 5. I also liked the ending where Miss Melny invites "Jesse" to sit next to her, hokey as it was. But it also holds true to the earlier episodes where Sam manages to be at the forefront of a major historical event, in this case fast-tracking the civil rights movement. Again, my favorite episode thus far. I predicted this would be your #1 since you're a big fan of The Challenge (and I'm not). And although there are obviously some differences between that episode and this one, there are some similarities in subject matter and tone. I'm not specifically drawn to shows with racial themes really, but I thought this had a good story and pacing and I loved the darkness of "The Challenge". Is there any specific to the racial plots that don't work for you since you gave the thumbs-down to both "The Challenge" and this episode. I think it's that I find stories of racial inequality disturbing and upsetting and therefore not as enjoyable as the more traditional "popcorn entertainment." I can generalize my favorites as any one where Sam is a female. However, this is by far in my top 10. I think every junior high or high school student studying American History should be required to watch this episode. Yes, this episode is not perfect but it humanizes a difficult concept that some young people can't relate to. When I was in Atlanta at the MLK birthplace, there was a movie about civil rights. Young people who watched it were all crying when it ended. QL deals with the "good, bad and ugly" of history. The simply freedoms that we take for granted such as drinking from a white's only fountain, riding in the front of the bus, seating at a lunch counter, and going to a hospital were not givens for the entire population. I agree with your favorite lines. But I liked two lines that Miz Melny said. "I'm old; not dead." and "I swear they switched babies at birth." They both make me smile. The ending of sitting at the lunch counter reminds me that we all have the ability to affect change. Strength comes in all sorts of packages. And finally, 'we shall overcome' is one of my favorite songs. Al sings it so well in the jailhoused. I did it again...I remembered something after I published my entry. When I was in high school in the Harrisburg, PA area. A black family moved into our suburian neighborhood. Their son was in my class at school and I remember going with him and a group of other classmates to Hershey park for 'school day.' Anyway, one night a KKK cross was burnt into their front lawn. It was very frightening. It was just in the next block from our split level home. Scary. I hadn't heard that story before -- that's awful.